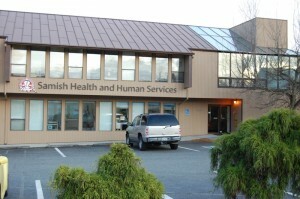 The Samish Indian Nation Health Services are located in Anacortes, WA with headquarters at the Health & Human Services Office at 1809 Commercial Avenue. The Tribe at this time provides primarily Contract Health Services, a Diabetes Project and a Public Health Nurse program to reach members with chronic health conditions through phone calls and home visits. The Tribe is exploring the partnerships with other medical practices in Anacortes to establish a small ambulatory clinic. The Samish Indian Nation administration currently serves over 2000 enrolled tribal members who reside predominantly in Washington State with several families residing in Oregon and dispersed throughout Idaho, Montana and Alaska. Additional households are located in British Columbia, Canada. Samish currently serves only enrolled tribal members living in the IHS approved service delivery area which includes Whatcom, Skagit, San Juan, Island, Snohomish, King, Pierce, Kitsap, Jefferson & Clallam counties. There were 549 Active users in 2014. Enrolled members of the Samish Indian Nation whose permanent residence is within a ten county region (Whatcom, Skagit, Kitsap, Snohomish, King, Island, San Juan, Pierce, Jefferson and Clallam) are eligible for Contract Health Services. In order to access this assistance, clients must register with the CHS office, and abide by the Samish CHS program guidelines. In general, CHS may pay for physician and other health professional services, dental services, prescriptions, vision care, physical therapy, hearing aids and mental health services. The Samish Council has recently expanded the coverage amounts for vision, dental, and orthodontics, effective March 1, 2015. The Samish Indian Nation (Tribe or Samish) is a descendent entity of the Samish Tribe, a signatory to the Point Elliott Treaty of 1885. Following the treaty signing the Samish were to be removed to the Bellingham Bay Agency. Fearing religious oppression, the Samish refused to leave Samish Island and other area villages. The Samish maintained their villages throughout the northwest Washington islands and marine shores despite repeated conflicts and failures to be granted the reservation they were promised. In 1969 the Bureau of Indian Affairs made an omission of the Samish from the list of federally recognized tribes. A 27-year series of legal battles ensued in order to regain federal status, during which time the tribal members continued to scatter in search of income and opportunities. This created a tribal population that is more urban than many reservation communities in the United States. One of the main arguments raised by the Bureau of Indian Affairs to deny the appeals by Samish leaders was the widespread geographical profile of the Samish people, implying that no real tribal community existed. Fortunately the Federal District Court judge found in favor of the Tribe possessed wrote in his opinion that in this day of electronic communication, with telephones, faxes and email linking the globe, certainly a tribal community could and indeed does exist regardless of perceived geographical barriers. The Tribe, with over 2000 tribal members living mostly throughout the more populated areas of Puget Sound, has taken advantage of technology to conduct business and preserve the culture. All seven Tribal Council and the 50 tribal staff members use technology in the course of their work. There is little doubt the Tribe is actively living up to the name Judge Torbett coined when he dubbed Samish the Cyber Tribe in his 1994 opinion. A General Council governs the Samish. An annual General Council meeting is held the last sunday in June. The General Council gives direction to the seven-member Tribal Council and maintains active participation through the seven Tribal Council appointed committees: Natural Resources, Health and Human Services, Housing, Personnel, Enrollment, Election and Cultural. The Samish Tribal Council envisions a virtual Indian community where each tribal member is connected to tribal government and tribal administration via telecommunications. The Samish are people of the salt water, canoes linked the numerous villages prior to European contact, and we are bringing our people home to the culture through participation in the annual Coast Salish Tribal Journeys Canoe celebrations. The Samish have historically been known as master carvers and blanket weavers, and recently these skills are once again emerging from our membership. Epidemics of measles, smallpox, and ague, and attacks from Haida and Tsimshian from the north diminished the population to approximately 150 members in one village by 1855, at the time of the signing of the Point Elliott Treaty. Though 113 Samish were present at the treaty negotiations and signing, no Samish signed the Point Elliott Treaty. The Samish were attached to the treaty by the signature of the Lummi chief Chow-its-hoot. Lacking a reservation of their own, many Samish were sent to live on the reservations of the Lummi or the Swinomish. However, many Samish refused to go to the reservations and stayed in their traditional territory. They were often confused with the Skagit, and when they went to the Swinomish Reservation, they received only six household land allotments for the entire Tribe. Many members went to Guemes Island to establish New Guemes (now referred to as “Potlatch Beach”), where they built a longhouse that housed more than 100 people. By 1912, the Samish had either moved onto the Swinomish Reservation or into other communities. They had been pushed off the island by white settlers, as the Samish had occupied the land with the only fresh water. The Tribes traditional territory stretches over a wide seven-county region of Northwest Washington. This area, which ranges from the mountain tops of the Cascades westerly along the hills, woodlands, and river deltas, arriving at the far western shores of the San Juan Islands, which provides a backdrop for our history and cultural traditions that remain strong today. In 1847 the Tribe had over 2,000 members and because of the raids from Northern Tribes and epidemics of measles, small pox, and the ague (flu), the population of the tribe was decreased to approximately 150 at the time of the signing of the Point Elliott Treaty. Anacortes is situated on Fidalgo Island, accessible by bridge to the mainland, and is often known as the gateway to the San Juan Islands via the Washington State ferry system. Seattle is 80 miles south, and Vancouver BC is 90 miles north. Numerous beaches and protected forestlands provide ample opportunity for hiking, beachcombing, whale watching, kayaking and other outdoor activities. Skiing and snowboarding are available two hours away at Mt. Baker Resort. They are a Central Coast Salish people. Through the years, they were assigned to reservations dominated by other Tribes, for instance, the Swinomish Indians of the Swinomish Reservation of Washington and the Tulalip Tribes of the Tulalip Reservation. A language preservation project has digitally encoded over 200 hours of interviews with first language speakers for use as the foundation of an interactive Samish language program. Added to these accomplishments is the Tribal website, in constant revision and update. With a few fluent first speakers of the Samish language still living, the Tribe is also actively pursuing high tech methods of reintroducing the language among our widespread population through Distance Learning and web based formats. The Samish language is a dialect of the Northern Straits Salish (Lkungen) language; a close sister language is Southern Straits Salish (Clallam or Klallam. Both are in the Central Coast Salish branch of Coast Salish, itself a branch of the large Salish(an) language family (Tim Montler 1999: “Language and dialect variation in Straits Salishan”. Anthropological Linguistics 41 (4): 462–502, Kuipers, Aert H. Salish Etymological Dictionary. Missoula, MT: Linguistics Laboratory, University of Montana, 2002. ISBN 1-879763-16-8) Coast Salish. Linguistically and culturally, the Tribe is grouped as Coast Salish, speaking a dialect of Coast Salish known as “Straits Salish,” rather than Lushsootseed dialect as some of our immediate neighbors to the east. In 1990, the Canadian Museum of Civilization published A Phonology, Morphology, and Classified Word List for the Samish Dialect of Straits Salish, by Brent D. Galloway . This is the first grammatical sketch and extensive word list for the Samish dialect; it was based on linguistic field work by Galloway with the last-known remaining speakers. Galloway’s recorded tapes are on file with the Museum of Civilization and the Samish Nation. Three or four fluent or partially fluent speakers remain as of 2013. During the first weekend in August, the annual Anacortes Arts Festival attracts art sellers and art lovers from all over the state. A weekend of art shows, children’s activities, food and entertainment center around the 250 booths lining Commercial Avenue. Many small art galleries are open year round, in addition to unique shops in the old town district. The tribe owns 11.2 acres of land at Highway 20 and Thompson Road in Anacortes, and is awaiting approval from the U.S. Department of the Interior to put it into federal trust, which is required to build a casino. The Samish fished in the islands and channels off the coast of Skagit County, Washington. The Samish had villages on Samish, Guemes, and Fidalgo Islands, and fished and harvested resources there and in the San Juan Islands. Estimated Tribal enrollment: 2065 enrolled members. The Tribe employs about 504 FTE. In 1926, a formal constitution was written by the Samish. They later altered it, but included a plan for electoral government. An annual General Council meeting is held the last Sunday in June. The General Council gives direction to the seven-member Tribal Council and maintains active participation through the seven Tribal Council appointed committees: Natural Resources, Health and Human Services, Housing, Personnel, Enrollment, Election and Cultural. Some of the Tribal activities are concerned with: Fidalgo Bay Resort, Archives, Culture, Natural Resources, Family Services, Head Start and Early Learning, Elders, Enrollment, Education, Language, Tribal Vocational Rehabilitation, and Planning. In 1971, in settlement of their land claim against the federal government, the Tribe was awarded US$5,754.96 for lands taken by the Point Elliott Treaty. The judgment deemed that they had exclusively occupied 9,233 acres of land at the time of the treaty. In 1996, the Samish were officially re-recognized by the U.S. government. In 1998, they changed their official name to the Samish Indian Nation. Today Samish’s population is now 1,200, and Samish has acquired more than 360 acres in its traditional territory, including Huckleberry Island. A small microclimate keeps Anacortes drier than most other parts of the northwest, we have about 40 more days of sunshine than Seattle, and 12 inches less rainfall as well. Temperatures average 45 in winter, and about 70 in summer.